Two attorneys with families involved in many aspects of life in Logan and surrounding counties have opened their own law practice directly across from the Logan County Justice Center at 348 West Fourth Street in Russellville. 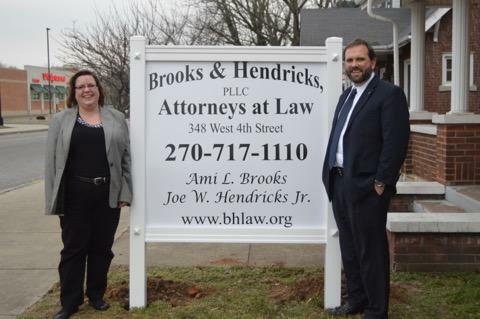 Ami Brooks and Joe Hendricks are partners in the firm Brooks & Hendricks, PLLC, Attorneys at Law. They were previously in partnership with long-time Russellville attorney James Milam and are grateful to him for the support and encouragement he has provided them over the years in getting established here. 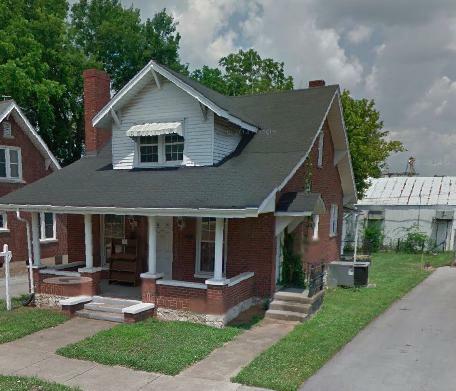 They felt that Milam’s office on Carrico Park Square at the corner of West Fourth Street was no longer large enough to accommodate their growing practices. When this site became available, they acquired the new location. Milam continues his law practice in his familiar location. Their new practice is headquartered in the former office of attorney Larry Cook, who is now an attorney in Franklin, Tenn. In fact, Cook’s daughter, Lisa Boone, is their legal assistant. Her husband Frank works at Logan Aluminum. Joe Hendricks attended Auburn Elementary and Middle schools and is a 1988 graduate of Logan County High School. He is the son of South Logan farmers Joe Wayne and Cathie Hendricks and the brother of former Adairville Councilman Bill Hendricks, who now works with Don Halcomb at Walnut Grove Farms. While he was studying at the Georgia State University School of Law, he interned at the U.S. Attorney’s office in Atlanta. When he graduated in 1995, he became as assistant district attorney from 1995-98. After that he had his own practice in Canton, Ga. from 1998-2004 before being elected district attorney twice, serving in that office from 2005-2012. When it was time to reenter private practice, he and his wife Kaye decided they were ready to move back to Kentucky. He entered into association with Milam and Brooks in 2013 and worked out of that office for two years. Kaye teaches at Adairville Elementary School. Their son John is an eighth grader at Adairville where he just finished his middle school basketball career. He is a member of the LCHS golf team even though he isn’t in high school yet. Joe Hendricks is a member of the board of the Logan County Chamber of Commerce, is the attorney for the East Logan Water District, and provides legal services for the Cougar Athletic Foundation. Ami Brooks has lived in Logan County since 1997 when her husband, David Brooks, came to teach and coach at Logan County High School. He is a counselor at the school now. David grew up on a Grayson County farm, but young couple had been living on the Indiana side of Chicago where David was teaching before a relative, LCHS educator Dwight Cockrill, let them know about an opening at LCHS and they became Logan Countians. Ami grew up in Bowling Green, the daughter of Horace and Anita Shrader. Her dad was the first dorm director of Pearce Ford Tower. Her grandfather, Willard Cockrill, was the first weatherman on WBKO television. Their daughter Katie attended Auburn School and began lettering in high school varsity sports as a sixth grader. She is now a member of the LCHS golf, swim and track teams. Both of the attorneys are members of Russellville Rotary Club. Ami Brooks started working in James Milam’s law office as a secretary in 2000, and three years later she started attending law school in Nashville at night. She passed the Tennessee bar examination in 2008 and the Kentucky bar in 2011. During those years that her entire law practice was exclusively in Tennessee, she built a good practice there, which still is part of the Brooks & Hendricks firm’s reach today. The Brooks & Hendricks Tennessee office is located at 509 West Court Square in Springfield. Estate planning is one of the areas in which the firm is involved extensively. “We do all we can to protect family farms,” says Hendricks, who grew up in a multi-generational farming environment. Brooks has been working on getting a bill passed in the Kentucky General Assembly which would make changes to Juvenile Code definitions and enforce more accountability in the social services cabinet. “There should be more focus on families,” she contends. Brooks and Hendricks also handle criminal law cases. Hendricks’ experience as a prosecutor helps them to prepare as defense attorneys. “We are involved in most areas of law except for representing those filing for bankruptcy, since many of our clients are businesses,” they explain. To learn more about the Brooks & Hendricks firm, visit their website at http://www.bhlaw.org or call 270-717-1110 or 615-382-9147.